Prince William, Duke of Cambridge meets members of the England Women's Football team during a breakfast reception at Kensington Palace. The Duke of Cambridge has praised the England women’s football team for eclipsing their male counterparts with their "fantastic" World Cup performance. William, president of the Football Association, hosted a Kensington Palace reception for the footballers, who won a bronze medal in Canada – the best England result at a major tournament not played on home soil. The squad had been wished well in person by the Duke before they left for the World Cup and he remained in regular contact, sending the players messages, speaking to them by phone and staying up into the early hours to watch their matches. And he shared many laughs with them during the breakfast event, telling the women: "You showed the men how to do it – I really mean it." He also told the team that the country had been supporting them while they were away: "You really gave it your all, and everybody here noticed it – social media was alive with it. "I’m so proud now it’s the Euros," he said, adding, to laughs from the players: "Now the pressure really starts." He went on: "What you created as a team – it’s fantastic. You’re only going to get bigger and better." William joked about his son, Prince George, telling the team "I was going to bring George this morning", and when they let out a collective sigh of disappointment he said the toddler was playing with his toy plane. One of England’s most senior players, Casey Stoney, dismissed the row over a tweet from the official England FA Twitter account, criticised on social media as sexist, which welcomed the players back earlier this week with the words; " Our #lionnesses go back to being mothers, partners and daughters today, but they have taken on another title – heroes." The former England captain said: "I find it incredible that someone would find that sexist. "When I came back to this country was I a mum? Yes. Was I a daughter? Yes. "To me it was black and white, just facts, and to be called a hero is amazing." The players later visited Downing Street for a reception where they were hoping to meet Prime Minister David Cameron. 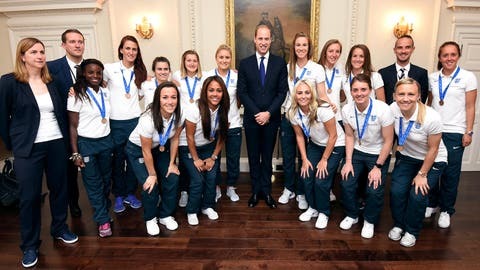 In Downing Street, Mr Cameron met head coach Mark Sampson and his squad, who all wore their bronze World Cup medals. The Lionesses finished the tournament, staged in Canada, as Europe’s top side after their 1-0 third-place play-off win over Germany in Edmonton at the weekend. Huge interest has built up around the England squad over the last month, resulting in the FA launching a participation drive, called We Can Play. The initiative is aimed at encouraging girls aged between seven and 12 to sign up and find out where they can get involved with football. Some of the players will change out of their tracksuits and T-shirts later for an appearance at Wimbledon, where they will take their seats to watch the women’s semi-final matches. Stoney said of the England team’s achievement: "For me to sum it up, I call it life-changing. I don’t mean financially, I mean what we’ve done for women’s sport."